This year's theme of the 2019 Tucson Women's March was celebrating the diverse cultures and communities of Southern Arizona. 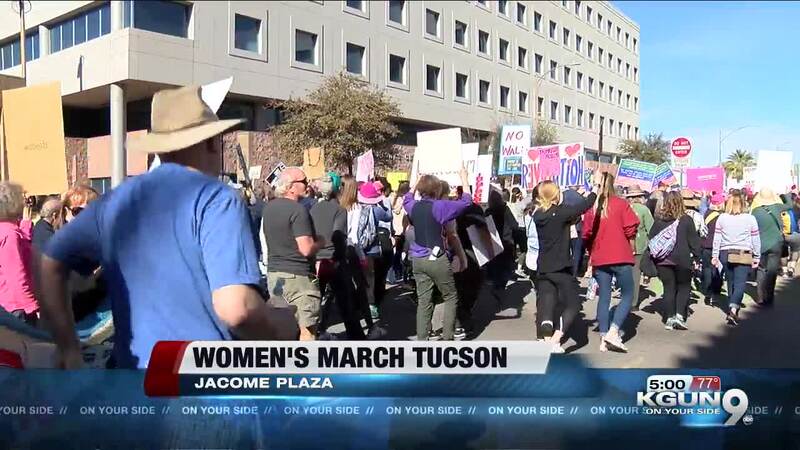 TUCSON, Ariz. - It's a march for women's rights across the country , including here in Tucson. This year's theme of the 2019 Tucson Women's March was celebrating the diverse cultures and communities of Southern Arizona. Sunday's march comes amid the national Women's March Organization facing accusations of anti-semitism. Local organizers told KGUN9 they wanted to steer clear of the controversy. Using your voice -- a Women's March mantra -- is the driving force behind the Tucson Women's March. Jude Johnson says she's marched every year because more work still needs to be done for equal rights. "I grew up when Ruth Bader Ginsberg was fighting for our rights," Johnson said. "We are still fighting for those rights. They encompass a lot, but it's basically that women need to have their voice, and women need to use their voice." Speakers and attendees voiced their opinion on migrants seeking asylum and denounced President Trump's proposed border wall. "Our grandparents were refugees, they were migrants," Judy Reisman said. "And I feel it's really important for the children and the grandchildren of migrants to stand up and let it be known, that this country would not be what it is if there weren't migrants who were allowed to come in." Tohono O'odom and indigenous women led the march around Jacome Plaza, showcasing the diversity of Southern Arizona.